Click Here to plan a route to us. Nearest Postcode is EN2 9AJ. Parking is available at the end of Beggars Hollow. The nearest train station is Gordon Hill or buses W8 and 191. Please use Whitewebbs Golf Course car park, via Beggars Hollow, which is the first turning behind the Rose & Crown public house. DO NOT park in Browning Road alongside Hilly Fields as it obstructs the traffic. 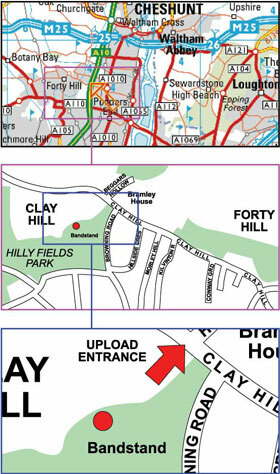 For Blue Badge holders please contact us (info@hillyfields.info) and we can make arrangements for your parking. In the event of bad weather we will use St Luke’s Church; check website and Facebook page for updates. There will be an ice cream van. Please note there are no toilet facilities.